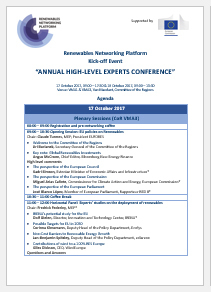 The Annual High-Level Experts Conference (AHLEC2017) took place on 17th and 18th of October 2017 in the European Committee of the Regions in Brussels. 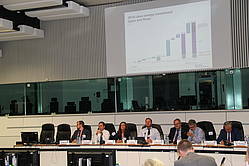 Key players from the European level gathered together with high level representatives from national, regional and local level to discuss the latest issues and bottlenecks for the continued deployment of renewables in the EU. Jan Geiss, Secretary General of EUFORES, opened the conference and presented the Renewables Networking Platform project and its main goals and activities. 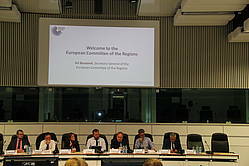 After the welcome and introduction speech, the floor was opened to Jiri Burianek, Secretary General of the European Committee of the Regions, who stated that this institution shared the priorities of the RNP project to foster a larger deployment of RES. The perspective of the European Commission was given by Paula Abreu Marques, Head of the Renewables Unit in DG Energy, who mentioned the need to deliver on the Paris Agreement commitments and, therefore, to build a strong policy framework. Chief Editor at Bloomberg New Energy Finance, Angus McCrone, gave a key note speech on global investments in renewables and highlighted that investment in RES in the EU peaked in 2011, whereas in Asia had a very relevant peak in 2015. Paolo Frankl, Head of the Renewable Energy Division at the IEA, presented the status and forecasts of renewables markets and system integration. He highlighted that key countries can accelerate RES deployment and that system integration needs power system transformation, market rules, flexible resources and more system friendly RES deployment. MEP José Blanco López presented the point of view of the European Parliament, stating that the EU is playing a crucial role in the energy transition and that it should take the leadership on the realisation of the Paris Agreement. Hence, he stated, we need ambitious targets, and not only at national level, and a sound legal framework that harmonises the market and promotes confidence in the system. The Counselor for Energy at the Estonian Permanent Representation to the EU, Siim Meeliste, underlined the need to test the measures and actions in order to see if they help brining more RES into the system and pointed out he important role of digital tools in making easier for citizens to participate in the system. The next session was dedicated to the presentation of several experts’ studies on the deployment of renewables, followed by a panel on multilevel governance in which it was discussed the technical and economic added value of local RES deployment, the role of cities and the importance of stakeholder involvement in long-term planning. The afternoon was divided into two parallel workshops: one dedicated to renewables in heating and cooling and the other on renewables in electricity. 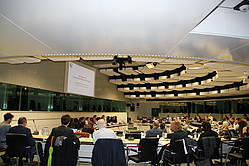 All parallel sessions were chaired by MEPs involved in the European energy policies such as Miapetra Kumpula-Natri, Clare Moody, Morten Helveg Petersen and Claude Turmes. 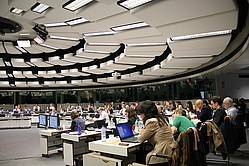 High-level experts from the European Commission, national ministries and agencies and the industry engaged in deep discussions regarding the above-mentioned topics. 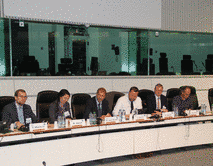 The second day of the conference was focused on the use of renewables in transport. 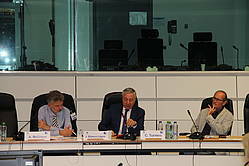 Bas Eickhout, MEP, chaired the discussion on electromobility and its impact on the GDP, the labour market and infrastructure planning; on the use of biofuels and the constant changes in projections for the automobile sector. 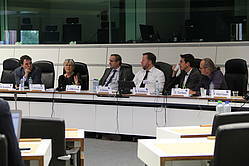 Finally, the closing session gathered representatives from the European Commission, civil society, the EU Council Presidency and the European Parliament to discuss the upcoming negotiations and political process of next year regarding renewable energy policies in the EU. Following these speeches, a lively Q&A session took place amongst the speakers and participants in which many important issues were raised. Angus McCrone, Bloomberg New Energy Finance: "Global Renewables Investments"
Paolo Frankl, IEA: "Renewables Markets and System Integration - Status and Forecasts"
Claude Turmes, European Parliament: "Latest update: Renewables in the EU energy package"
Dolf Gielen, IRENA, "Roadmap for a Renewable Energy Future"
Corinna Klessmann, Ecofys: "Possible Targets for EU in 2030"
Jan-Benjamin Spitzley, eclareon: "Non-Cost Barriers to Renewable Energy Growth"
Giles Dickson, WindEurope: "Contributions of wind to a 100% RES Europe"
Christian Synwoldt, University of Trier, Umwelt-Campus Birkenfeld: "Technical and economic added value of local RES deployment"
Stephan Brandligt, City of Delft (The Netherlands): "The Role of the Cities"
Imke Lübbeke, WWF: "The importance of stakeholder involvement in long-term planning"
Nigel Cotton, European Copper Institute: "RES-H&C: A complex universe"
Tobias Fleiter, Fraunhofer ISI: "RES-H&C potentials and breakthrough requirements"
Eva Hoos, European Commission: "The Clean Energy Package: an opportunity to accelerate RES-H+C deployment"
Vlasis Oikonomou, IEECP (Institute for European Energy and Climate Policy): "Lessons from implementation of the Energy Efficiency Obligations (Art. 7 EED) and the role of evaluations"
Mario Ragwitz, Fraunhofer ISI: "Market readiness for renewables in Europe"
Robert Brückmann, Head of the Policy Department, eclareon: "Weighted Average Cost of Capital – a game changer"
Corinna Klessmann, Ecofys: "Macro-regional governance - opportunities and challenges"
Pete Harrison, European Climate Foundation: "The economics of e-mobility"
Anne Grete Holmsgaard, Biorefining Alliance: "Green transport roadmap"
Dominik Bach, KfW Bankengruppe: "Financing renewables"
For a larger selection of pictures taken at the AHLEC2017, please visit the EUFORES Flickr Account here.